The most popular character from the Looney Tunes universe by Warner Brothers. 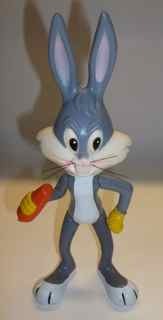 This Bugs Bunny figure from 1971 stands 11 inches tall and is made by Dakin. Figure is in excellent condition with little wear. He has a plastic body with rubber removable head.